This spectacular glacial lake is circled by Wedgemount and Armchair Glaciers. Wedge Mountain, 2,891 metres, the highest peak in the park, lies to the south. This is a popular destination for mountaineers. Turn right off Hwy 99, 13 km north of Whistler. You must cross the BC Rail train track to access the road. Use caution as this is an uncontrolled railway crossing. The parking lot is located 2 km from Hwy 99 along a Forest Service road. There are no garbage facilities, so always pack out what you pack in! There is a small hut available as an emergency shelter and bear cache. There are no garbage facilities so pack out what you pack in! 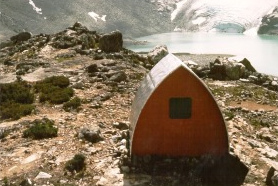 Camping is permitted at designated campsites on the ridge near the hut and at Wedgemount Lake near the inlet from the Armchair Glacier. There are 10 tent pads at each location (20 in total). A year-round pit toilet is located near the hut and another is erected near the lake sites during the summer season. No other amenities are provided. The camping areas and the shelter at Wedgemount Lake are operated on a first-come, first-served basis. A reservation guarantees you a space, but not a specific spot or tentpad. Camping is permitted in designated areas only. Camping fees are in effect year-round and must be paid in full before entering the park. Proof of payment must be carried at all times while in the park. Parking lot to Wedgemount Lake: Length, 7 km; suggested time, 4 to 6 hours one way; elevation change, 1,200 metres. The upper part of the trail provides a view of a waterfall where Wedgemount Creek tumbles down for almost 300 metres in a white spray. The last part of the trail climbs steeply up a boulder strewn slope which can be slippery when wet. This trail is steep and strenuous but offers very rewarding views from the top.